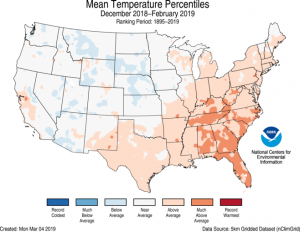 The latest seasonal climate summary for the Southeast is now available from the Southeast Regional Climate Center. 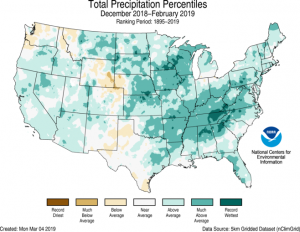 You can find it at http://www.sercc.com/SoutheastRegionQuarterlyReportWinter2018_19.pdf. 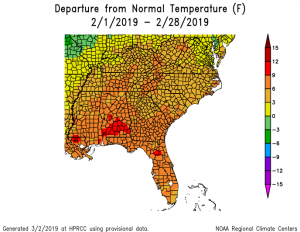 You can see the latest monthly climate summary (text) for the Southeast for February 2019 from the Southeast Regional Climate Center at http://www.sercc.com/SoutheastRegionMonthlyClimateReportFebruary2019.pdf. 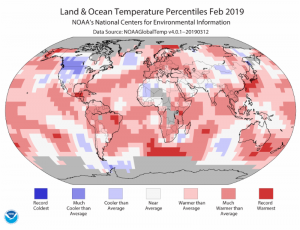 The latest monthly summary for February 2o19 is now available from the Florida Climate Center as a PDF download at https://climatecenter.fsu.edu/products-services/summaries?id=533. 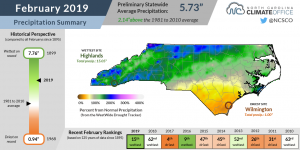 The latest monthly climate summary from North Carolina is now available at http://climate.ncsu.edu/climateblog?id=279.